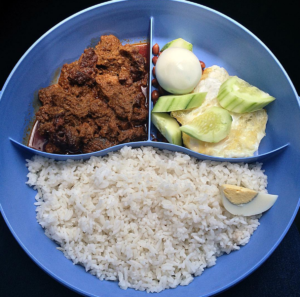 Nasi lemak could be considered Malaysia’s national dish. If we could put this on the Malaysian flag we could. Yes, it’s quite significant. A little leaf parcel that cradles a bed of coconut rice with spicy sambal, crunchy dried anchovies, cucumber, roasted peanuts and egg. While considered classic comfort food, it’s a showcase of flavors and textures, from the delicate coconut to the brash belacan, the tender bite of rice and the salty crunch of anchovies. It’s by far the best Malay food I’ve had. Sinful and bad for the heart butincredibly delicious. Best eaten once in a while! 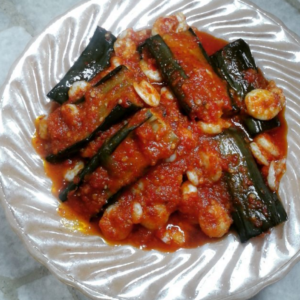 Best eaten in combination with something sweet sambal is a chili sauce. 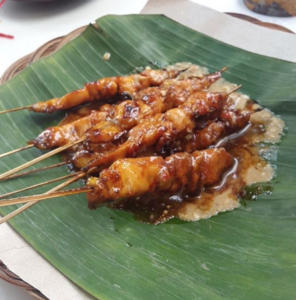 With many variations made with fish, prawn, and even cuttlefish each better than the other! Fresh shrimp are pleasantly cooling against the spicy sambal—which just makes me go back for more sambal, of course. The Malaysian version of salsa minus the red-peppers! Rendang is beef stewed in coconut milk and spices. It’s not like a curry and traditionally served dry. It’s dark, spicy and somehow tastes sweet as well. It’s traditionally served dry, but in Malaysia, you’ll find it moist most of the times, combined mostly with rice like most Asian dishes. And goes excellently well with ‘Nasi Lemak’ too. 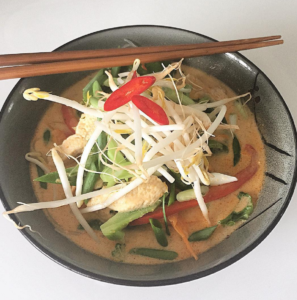 Laksa is a spicy noodle soup dish. There’s two main variations in Malaysia which is Curry Laksa and Asam Laksa. I used to get confused with the two because it didn’t occur to me that they were different. Asam is sour and fishy whereas the curry one is coconut milky. You can actually get Asam Laksa instant noodle from Maggi. However, I prefer the curry one, the rempah (spice paste) of turmeric and ginger and lemongrass, chilies and belacan, imparts flavor to the coconut milk broth; along with noodles, it’ll be topped with shrimp, tofu puffs, cucumber, fish balls, and eggs. The food looks so delicious…Thanks for the tips!! Loved reading this, Malaysia is one of my all time favourites! I’m heading back in September, and I can’t wait to experience the food again.